Life Before the Dinosaurs: Amiskwia. 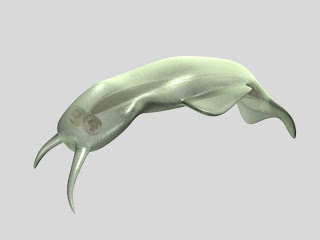 Amiskwia was a bizarre genus of Cambrian animal. It was about one inch long and probably used its flat tail to swim. 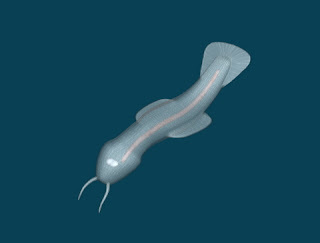 When Charles Doolittle Walcott first discovered Amiskwia in the Burgess Shale, he described it to be a chaetognath, sometimes called an arrow worm. Then later, other scientists classified it as a ribbon worm. But now no one really knows what it was. Amiskwia looked like a fat worm with a head that had two antenna-like tentacles on it. On the side it had stubby fins, and on the back end it had a paddle-like tail possibly for locomotion. Specimens of Amiskwia are almost transparent so that the internal organs are visible. Amiskwia is a rare fossil because only 18 specimens have been found in the Burgess Shale. Because of its hydrodynamic shape and its powerful tail, Amiskwia looks like it could have been a fast swimmer. Maybe the reason why Amiskwia is rare could be that they were territorial and living very far away from each other. But that's just my hypothesis. I finally started reading 'Crucible Of Creation'. (My local library had to borrow a copy from Miami) I really liked 'Wonderful Life' when it cam out, and this book is sort of a rebuttal to that. You should write a review of both of them!